I apologise if this seems a very simple question, and also if I am overlooking something that is very simple. Given that relative abundance implies that all values are relative to each other, how can all of the relative abundances sum to a number that is greater than 100? 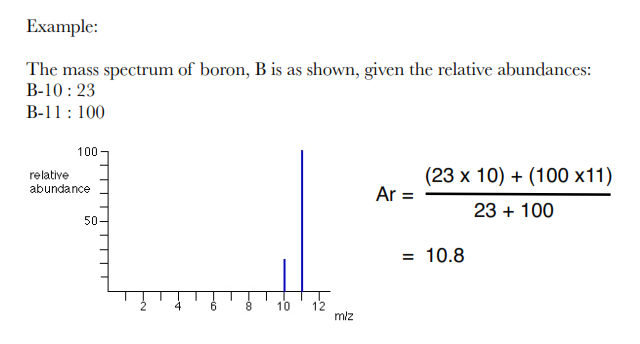 2.3:10, 23:100 and (23/123):(100/123) are all correct values for the ratio of the relative abundance of B-10 to B-11. However, only the last value, (23/123):(100/123) or 18.7:81.3 shows the normalized ratio of relative abundance of these isotopes. It is this normalized value that adds up to 100. Not the answer you're looking for? Browse other questions tagged physical-chemistry mass-spectrometry or ask your own question. How to interpret a MALDI mass spectrum? How to find the mass spectrum of Cl3+? Why would the 2+ molecular ion of butane have a mass spectrum peak at 29? Why is the molecular peak not observed in the mass spectrum of 2,2-dimethylbutane? Why is the relative atomic mass numerically equal to the gram atomic mass of the Atom? How many peaks of HCl are found in a mass spectrum?